Flavor bomb alert! 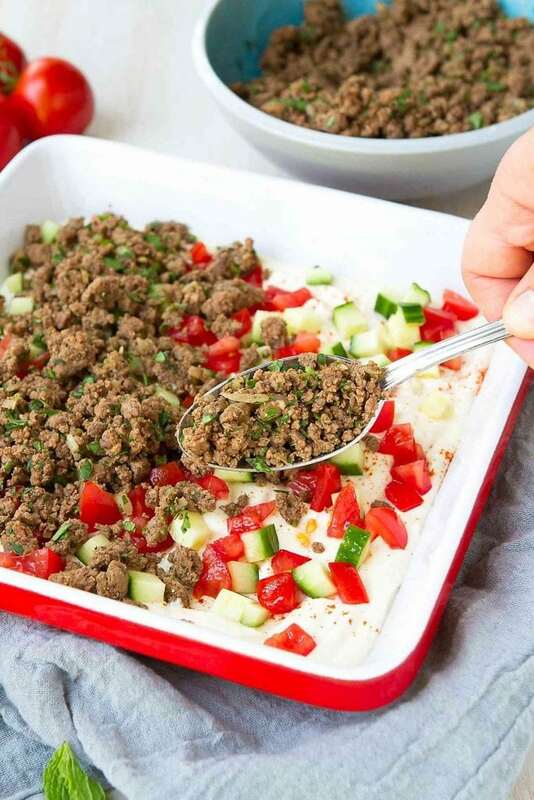 From the spiced ground beef to the hummus yogurt mixture and fresh veggies, this Beef Kofta Dip recipe will keep you dipping all day long. 146 calories and 3 Weight Watchers Freestyle SP. Thank you to Albertsons and Safeway for helping me share this recipe with you. There’s no doubt about it – when I eat well, I feel like a million bucks and I find that the older I get, the less I can get away with mindless eating. Anyone else in the same boat? In my book, eating well happens on a few different levels. First, it means loading up on seasonal fruits and veggies, and I’m in heaven now that I can find all of my summertime favorites at the grocery store again. The more I fill my plate with vegetables – starting with sautéed zucchini, mushrooms and spinach at breakfast – the less I want to eat junk food. Healthy fats, whole grains, less sugar and good protein sources. In combination, incorporating all of these into my diet makes a huge difference. Lately, I’ve made a concerted effort to increase healthy fats (think olive oil, avocados, and omega-3s from salmon and sardines – and even some saturated fats) and cut WAY back on anything involving sugars (oh man, I really needed this!). The increase in fats keeps me full longer and virtually cuts all of the “bad” cravings, while the decrease in sugar takes away that feeling of lethargy and general feeling of un-wellness that hits me after eating sweets. But there’s another aspect to injecting more “goodness” into my diet, one that I feel is often overlooked. Quality of ingredients. While I’ve always been pretty good about choosing high-quality ingredients, I find myself reading labels more and more as I realize that what goes into my body has such a profound effect on my mood and energy. What do I look for? Grass fed meats and responsible choice seafood are always on my mind. But perhaps what I hope NOT to see on a label is just as important – no artificial flavors, colors, sweeteners or preservatives; no partially hydrogenated oils; and no ingredients that require googling. One of the reasons I shop at my local Safeway is because of their Open Nature® line, which includes products that are high quality and minimally processed. Meats, seafood, crackers, ice cream, yogurt and even paper towels…the list goes on and on. 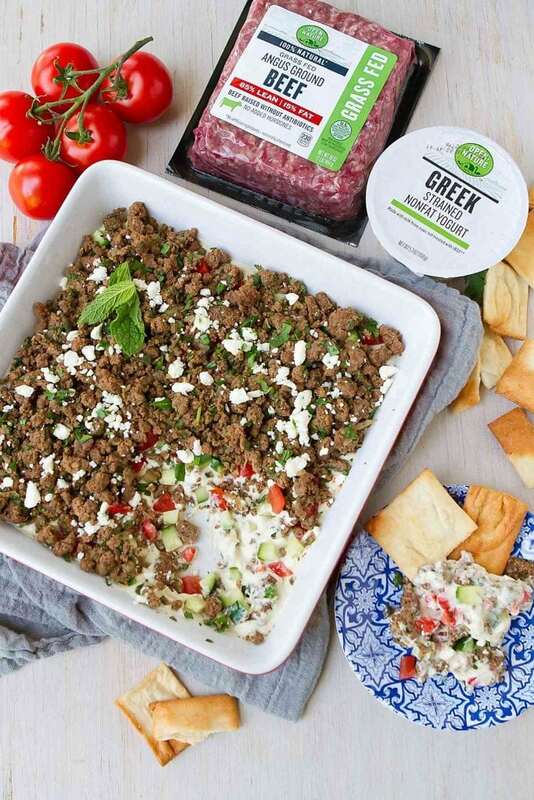 So, when I popped into Safeway to pick up the ingredients for this Beef Kofta Dip, all of the ingredients were at my fingertips. If you haven’t tried their grass fed lean ground beef, I suggest doing so ASAP. In my opinion, nothing compares with the flavor of grass fed beef. I didn’t have to strain a single drop of water or fat out of the beef while it was cooking. Every bit was usable (can you say value?!) and flavorful. And if you’re used to seeing sky-high prices for grass fed beef, I have a feeling you’ll be pleasantly surprised. • Kofta in general can refer to a variety of spiced meatball or meat kabob dishes. • In Middle Eastern cuisines, kofta is often shaped into small logs and shaped around skewers as kabobs. • There is some debate about the origins of kofta, though many seem to agree that the first mentions of it were from Persian culture. • As far as the spices go, I’ve seen everything from coriander, cinnamon, garlic and ginger to sumac, allspice and mint. In this dip recipe, I used a combination of these spices that worked with the rest of the ingredients. 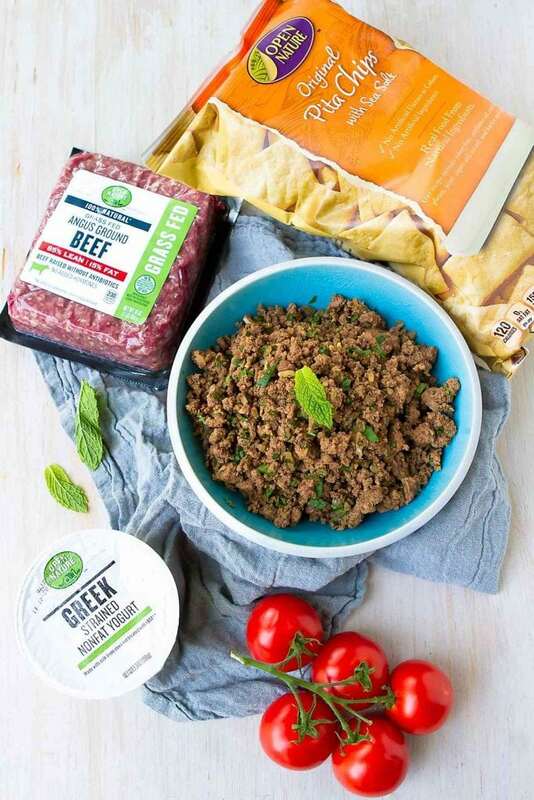 How do you make beef kofta dip? 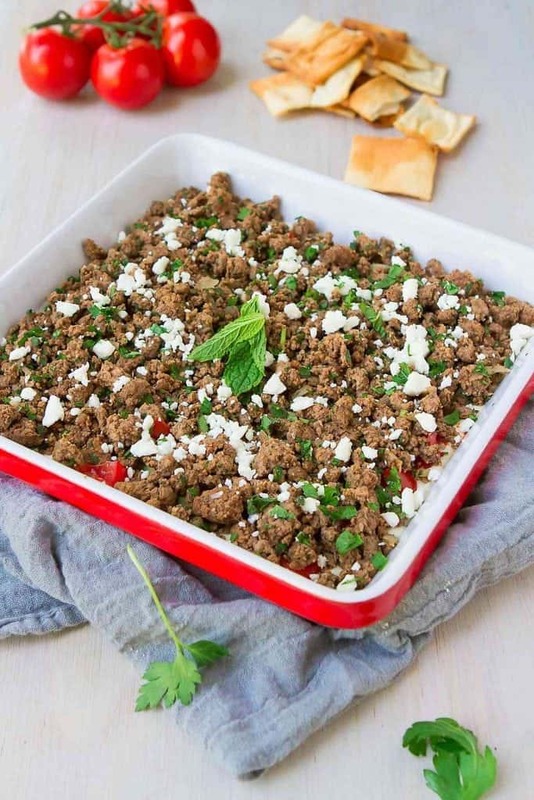 • Start by cooking the ground beef and onions, breaking up the ground beef with a wooden spoon as it cooks. Stir in the minced garlic, spices and chopped mint leaves. • In a bowl, stir together the Greek yogurt and hummus, then spread the mixture on the bottom of a serving dish. 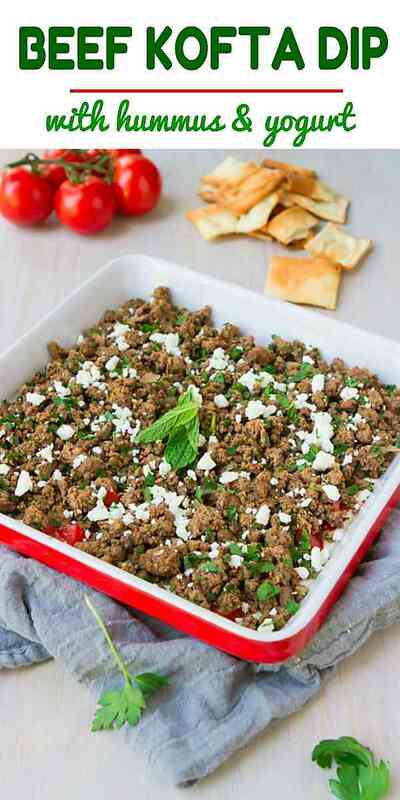 • Sprinkle chopped tomatoes and cucumbers over top, then layer on the cooked ground beef and feta cheese. • Serve it with sea salt pita chips (so addictive!) and watch it disappear in minutes! My local Safeway had everything I needed for this recipe. The Open Nature products are available in my area exclusively at Safeway and Albertsons stores. If you don’t have a Safeway in your area, you can find the Open Nature products at all of the Albertsons Companies family of stores, including ACME Markets, Jewel-Osco, Vons, Pavilions, Randalls, Tom Thumb, Shaws, Star Market, and Carrs/Safeway. Visit Albertsons.com or Safeway.com to find a store near you and discover more meal prep tips and recipe ideas. Add the ground beef and onions, and cook until the ground beef is cooked through, crumbling with a wooden spoon. Stir in the garlic, cumin, cinnamon, allspice, salt and pepper. Cook for 1 minute. Stir in the mint leaves. In a medium bowl, stir together the yogurt and hummus until combined. Layer the yogurt mixture in the bottom of an 8- by 8-inch serving dish. 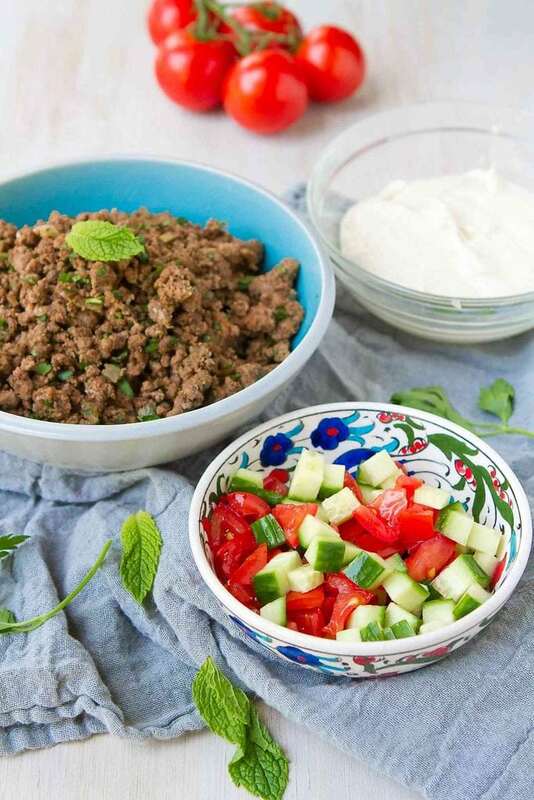 Arrange the tomatoes and cucumber over top, then layer the ground beef mixture and feta cheese over top. *Pita chips are not included in the nutritional information. Disclosure: This post is sponsored by Albertson’s and Safeway. All opinions are my own. I am a participant in the Amazon Services LLC Associates Program, an affiliate advertising program designed to provide a means for me to earn fees by linking to Amazon.com and affiliated sites.